May = the Fargo Marathon, summer weather, Mother's Day, our wedding anniversary, my birthday, my mom's birthday and likely our baby #2's birthday! 1.) LOCATION: Trail, Road or Indoors? 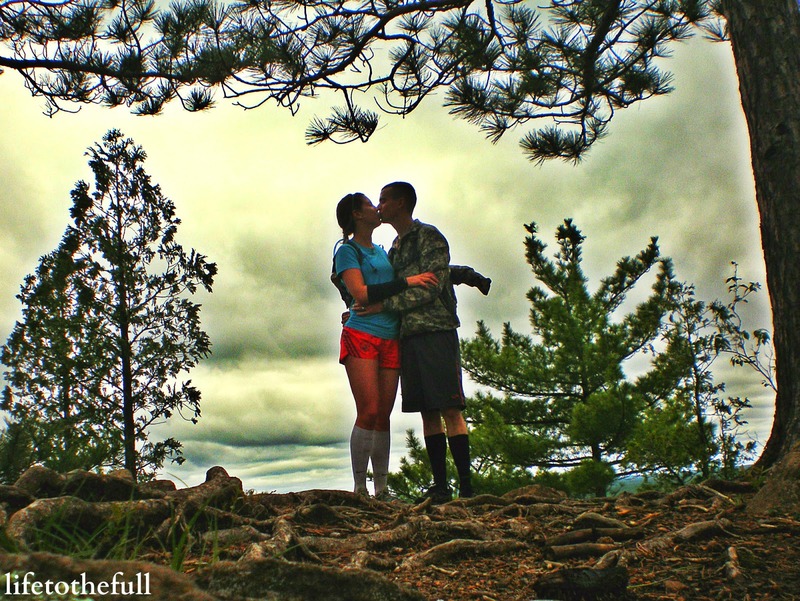 My heart belongs to trail running. My first full marathon was on the trails and there is never a dull moment. I don't trail run much anymore because I am usually pushing a jogging stroller along with me. These days, running outdoors is wonderful to me. 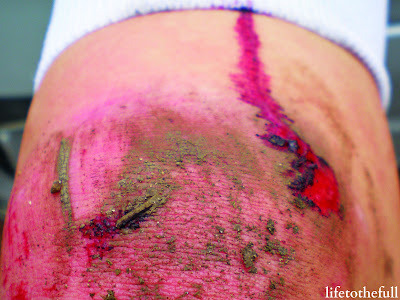 ... mud, blood and all. Now that's romance! 2.) TIME OF DAY: Morning, Noon or Evening? Morning, all the way! 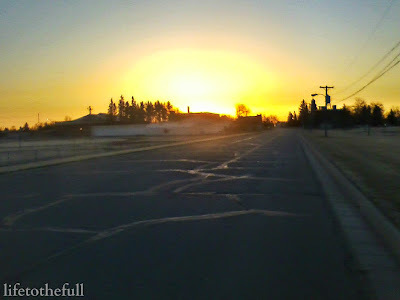 I am a morning person and there is nothing better than watching the sun rise on a run. Spending time talking with God on a morning run feels amazing - it's so peaceful and it feels like life slows down for a while. Watching a beautiful sunrise is like a little glimpse of Heaven. 3.) WEATHER: Sunshine, Mild or Hot? Sunshine and the 60's is a perfect race day for me with a light breeze (very light!). I'm not too picky on the temperature outside but the amount of wind really makes a difference. Running in any season is enjoyable if the wind isn't whipping around too crazy. 4.) FUEL: Before, After and sometimes during? While running pregnant, I make sure it eat and drink plenty before and after runs. Heck, I just eat all the time. When not preggo, I will maybe take a bite of a granola bar before a morning run but it's not necessary. If I'm training and plan to run for 90 minutes or more, I opt for eating a small breakfast before heading out. 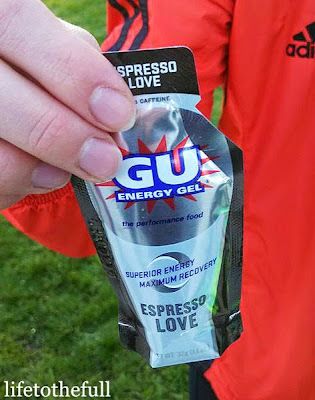 I bring with a GU or homemade gel for runs of 90 minutes+. 5.) ACCESSORIES: Music, Watch or more? My Garmin is always with me and usually our toddler in the jogging stroller, too. I always bring my phone with me while running pregnant - especially now in the 30+ weeks - just in case! When I'm training for a long race, I love to run solo with my iPod to just zone out. Music + jogging strollers do not mix! 6.) REWARD: Food, wine or ??? 7.) TYPE OF RUN: Long, tempo, intervals, hill repeats, progression, or easy? These days all of my runs are done at an "easy" effort and any run is a good run! 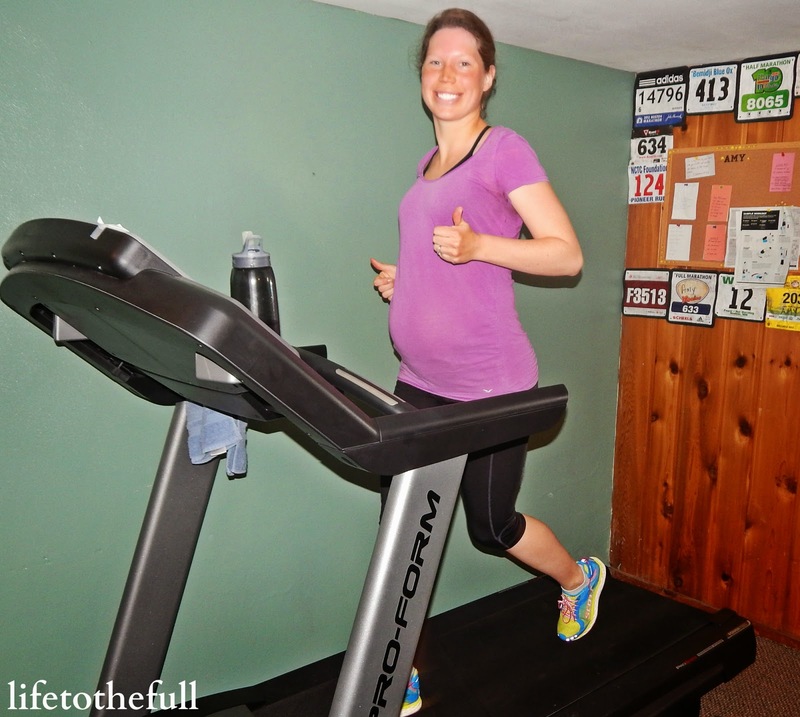 Running in the third trimester varies so much from day to day. Today could be a great run and, by tomorrow, baby's position may change and my bladder will be very uncomfortable. I'm taking one day at a time and keeping it easy until baby's big day! 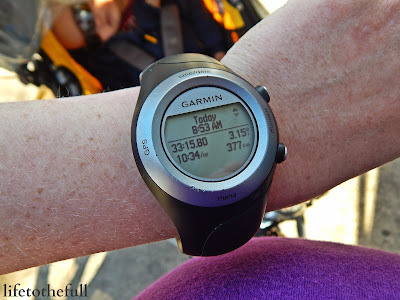 In my non-pregnant "training mode", tempo runs are my favorite but speed interval sessions are getting up there, too. Last year I started focusing on making each run with a specific focus - speed, hills, long, tempo, etc. - and it improved my running drastically. I'm excited to train for a full again using more focused training! Baby's Size: Butternut Squash, average fetus size: 17.2 to 18.7 in, 4.2 to 5.8 lbs. Cravings: Sourdough waffles, sausage, eggs, and gravy, toast. Aversions: Browning hamburger or venison. I'm Feeling: SO THANKFUL that God blessed us with this smooth week of pregnancy! With my first pregnancy, we discovered I had a UTI and was dehydrated at 33 weeks, had a preterm labor scare and took a ride in the ambulance... It was an intense time to say the least. Aside from bladder squishage, I'm feeling great. Sleep: I'm still feeling a lack of energy, especially in the PM, but that's to be expected. Every night of sleep requires 2 bathroom breaks. It's not so bad compared to being up with a newborn all night :) I'm so thankful E is consistently sleeping through the night! My Prayer for Baby: "Lord, thank You for watching over our baby this week and for helping my body to grow this new life. It is truly a miracle that I am so thankful to be a part of! Continue to prepare our family and all of our hearts for this new member of the family. I give any and all of my pregnancy and childbirth worries to You, knowing that You care about every detail of our lives. Guide baby's development and I pray that he or she will arrive in Your perfect timing! Amen. " Monday: 3.1 miles with the dog, 9:55/mile. A 5k to celebrate the Boston Marathon. Wednesday: 2 treadmill miles, 10:16/mile. Treadmill running always feels harder! Saturday: 3 mile family run, 11:05/mile. Beautiful day! 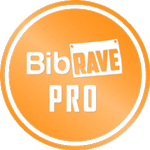 What are your running favorites? Linking up with Jill Conyers at Fitness Friday and Faith at Mommy Moments. great post! Thanks for playing along! May is a great month, it is my birthday too! 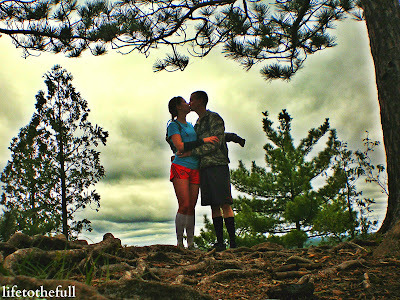 I have done a couple of trail runs and they are tons of fun- I should do more! You are looking FAB I hope it is smooth sailing til the end! Mary Beth, how awesome that you're in the May birthday club, too!!! Trail races are such a blast. 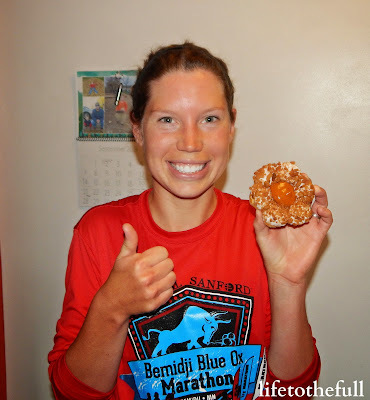 I'm hoping to run another trail marathon some day! You look great! Can't believe you only have a couple of weeks left until you meet your little one! I just added running into my workout routine, running on Fridays with a friend and it feels so good! I started running with her a couple of weeks ago, running 5 miles for the first time in a few years and it felt great! Now, I'm ready to start adding in a mile or two and see how I do. Maybe, there will be half marathon in my future!? Oh I could definitely see you running a half in the future, Melissa! CrossFit and running seem to go really well together! Thanks for the tag Amy! Given the choice between trails and roads trails will always win. I love speed work at the high school track. Thank you, Rachel! That belly... I'm feeling way "out there" at this point! Running is definitely a tricky activity to start while pregnant, just because it's a high impact exercise. I'm sure some women do it but it all depends on your doctor or midwife's recommendations! There are so many other great exercises to do while pregnant, too. 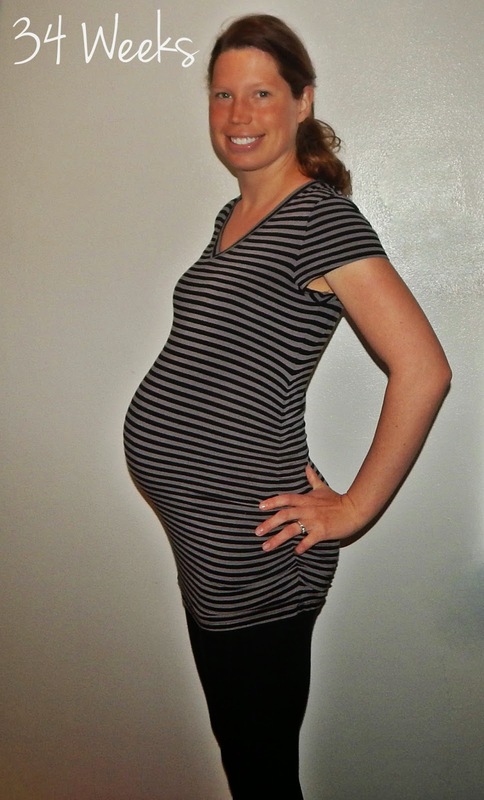 Prenatal yoga is a favorite of mine in the 3rd trimester!